During the first phase of BioMap Alaska we are focusing on 11 species of interest, but we welcome input on others as well. 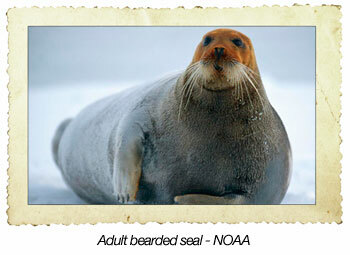 Some are important subsistence and/or commercial species, affected by climate change and sea ice variations. Others may be new to the region reflecting changes in the marine environment. In addition to sighting information, we are also interested in knowing about any abnormal occurrences that you observe. Tell us about other species that you have rarely or never seen before, as well as ones that may be from other areas. We would also like to know if you are noticing that a certain species has an abnormally low or high population based on your local knowledge or if certain species are moving earlier or later in the season than in years past. Our 11 species are: Crustaceans - red king crab and snow crab; Pinnipeds - walrus, ringed seal, spotted seal, and bearded seal; Cartilaginous Fish- Pacific sleeper shark and Alaska skate; Bony Fish- Chinook salmon, Alaska walleye pollock, and Bering wolffish. The FIELD GUIDE offers photographs and descriptions of these species. But you should feel free to contribute information on other species and let us know if you think we are missing something critical.